You must register and pay for the NMAT by GMAC™ exam before scheduling a test date and location.Note: Candidates are required to visit respective university/college/school website for details of their admission procedure. You have to submit their respective form separately. You must upload a photograph that bears likeness to you and the photograph on your Photo ID. This photograph will be included on the admit card that you must bring. Take the NMAT by GMAC™ exam to pursue the career of your dreams! The NMAT by GMAC™ exam opens doors to the leading management programmes in India. Brought to you by the organization that owns the GMAT® exam, the NMAT by GMAC™ enables schools to recruit top talent with the comfort that the test measures the skills needed to succeed in their programmes. It gives candidates the confidence to perform their best.The NMAT by GMAC™ exam is used for admissions to some of the leading graduate business programmes in India. Since becoming a computer based test in 2009, the NMAT by GMAC™ has been at the forefront of measurement in India as a valid and reliable predictor of success in graduate business school.Schools will have access to one of the more diverse test taking populations in India with some of the highest proportions of women and non-engineers taking the exam. Test takers will have access to practice materials to enhance their preparations. The NMAT by GMAC™ exam has been, and will continue to be, a symbol of quality – enabling test takers to access graduate management education and a career of choice, while providing schools access to top talent. Who administers NMAT by GMAC™ test? The NMAT by GMAC™ is a computer administered test owned by the Graduate Management Global Connection (India) Private Limited (GMGC), a subsidiary of Graduate Management Admission Council (GMAC). Which Universities / Business Schools accept NMAT by GMAC™ scores for admissions? When will the NMAT by GMAC™ exam be offered for admission session 2018-20? The NMAT by GMAC™ exam for the academic session 2018-20 will be offered in a testing window from Oct 5, 2017 to Dec 18, 2017. How is the NMAT by GMAC™ designed? The NMAT by GMAC™ exam has three sections: Language Skills, Quantitative Skills and Logical Reasoning. Each section is individually timed. Test takers need to answer questions of each section within the allotted section time. Once the test taker completes a section, whether the test taker selects to move to the next section or if time runs out, the test taker will not be able to return to that section. Test takers are advised to take the exam as a collection of “three individually timed” sections and they need to perform their best in each of the three sections in the given section time. Test takers should also understand that balance time of one section doesn’t get added onto the next section. So, test takers should be fully sure of themselves before moving on to the next section. Can a test taker review questions and /or sections? Yes, a test taker can review the sections of the exam within the allotted section time. The Review Screen at the end of every section will allow the test taker to either move directly to incomplete (unanswered) questions, flagged for review questions or review all or any questions. Once a test taker has moved ahead from one section to the next section, he/she will not be able to return to the previous section. Hence, test takers should complete (answering and reviewing) each of the three sections in their respective allotted time limits. If a test taker completes answering and reviewing a section before the allotted section time completion, does the balance time get added to the next section(s)? No, one cannot add balance time of one section to the other. If a test taker completes answering and reviewing a section before the allotted section time expires, he/she may choose either to revise the section or move to the next section, but the balance time cannot be added on to the next section timing. How is the NMAT by GMAC™ exam structured? NMAT by GMAC™ exam is a 120-minute test with three sections. Admit Card: Candidates are required to download their NMAT by GMAC™ Admit Card from their NMAT by GMAC account. Any other document as advised by NMAT by GMAC™ for differently abled candidates. Test takers who are unable to produce the above forms of valid ID (non–expired and in original) will not be admitted into the testing room and shall not be offered a test-fee refund. Important: If you are unable to produce the above forms of valid ID (non– expired, original format), Admit Card or confirmation email printout you will not be admitted into the testing room and will not receive a test fee refund. 75-day test window – ( Oct 5, 2017 to Dec 18, 2017 ) – A long test window provides test takers with the convenience of choosing a test date. What is the advantage of having a 75-day window to test? The 75-day window enables the assessment of a test taker’s best performance and at the same time reduces the stress associated with a single sitting test or test offered in a short time window. The longer test window provides the test takers flexibility to take the test when they are best prepared and avoid conflicts with other life events. The test takers will also get the convenience to reschedule the test in case of any exigency. The longer window also provides the test taker with the opportunity to retake the test (maximum 3 attempts, including "No Show") in case they feel that their performance was impaired on the test day for any reason or if they feel they can improve their performance in retake attempt. Are there any eligibility requirements to sit for the NMAT by GMAC™? All test takers who complete the Test Registration process pay the test fee within the time specified and follow the published NMAT by GMAC™exam terms and conditions may sit for the NMAT by GMAC™exam. It is the responsibility of the test taker to understand the eligibility requirements of all the universities and schools to which he/she is interested in applying before registering for NMAT by GMAC™ exam. If the test taker registers for the test and then determine that he/she is ineligible for admission to the desired program, no test fee refund will be made. For the eligibility requirements, test takers are advised to check the websites of each university and school where they plan to apply. Will the content of the NMAT change this year? The content will not change for the NMAT by GMAC™. The exam will be a multiple-choice question paper that includes Quantitative Ability, Language Skills and Logical Reasoning. What is the test fee for NMAT by GMAC™? What are the important dates for the NMAT by GMAC™? The important dates for the NMAT by GMAC™ exam are listed below. * GMGC reserves the right to make any change to the above dates and test takers are advised to visit this website periodically to note any changes. What are the modes of fee payment for NMAT by GMAC™? When and how will a test taker come to know of the test date and location of the test? After the registration and payment being received by NMAT by GMAC™, test takers will receive an e-mail (at the e-mail id specified by them in the online application form) confirming their registration for the NMAT by GMAC™exam. Candidates can schedule their exams through the scheduling exam tab in candidate dashboard available in the account of the candidates.The test takers will get to choose the date, time slot and location of their preference subject to availability on a First come First Serve basis. The Pearson VUE system shows the availability of seats at the test center on real time basis. Within 24 hours of scheduling the test, the test taker will receive a confirmation e-mail mentioning their test venue name and address along with date and time of the test. Test takers are advised to contact the Pearson VUE helpdesk (0120 4397855, nmatbygmacsupport@pearson.com) if they do not receive the e-mail within 24 hours of scheduling the test. Where will the test be administered? *Some cities will have multiple test centres to choose from. GMAC reserves the rights to change the test centres as may be required without any prior notice. The NMAT by GMAC™ will also be offered at following international locations. How many times can a test taker take NMAT by GMAC™? If a test taker takes the NMAT by GMAC™ exam more than 1 time, which of the scores out of these attempts will be considered by NMAT by GMAC™ accepting Schools? Please visit respective NMAT by GMAC™ accepting school website for their policies on acceptance of NMAT score. Will a test taker lose out in competing with others if he/she takes the NMAT by GMAC™ only once? No. The test taker will not lose out in competing with others if he/she takes the NMAT by GMAC™ by only once. Test takers are advised not to get misled by others opinion on tests being easy or difficult in any given period of the test window. A test taker may be able to improve his/her score provided he/she performs better in re-takes. However, there is no guarantee that the scores will improve in subsequent attempts/retakes. Scores will be equated for all test takers and percentile scores will be calculated after all test takers have taken their test(s). Please refer www.nmat.org.in.for final result announcement date. What is the rationale behind allowing test takers to test multiple times? Test takers have the option to take the NMAT by GMAC™ exam a maximum choice of three times during the 75-day testing window. This option enables the assessment of the test takers’ best performance. When will the NMAT by GMAC™ results be declared? The NMAT by GMAC™ scaled scores by section and test total scaled score will be announced within 4 to 5 weeks after the test taker has tested. The percentile scores will be calculated after all the test takers have taken their exam(s). Please refer www.nmat.org.in for final result announcement date. What do you mean by scaled scores and percentile scores? Scaled scores - All the test forms are equated to account for any differences in overall difficulty and the raw test scores are placed on a common scale. This is done to ensure scores are comparable across test forms such that the scores are not impacted by different test takers getting different test forms. Percentile scores - The percentile rank or score shows how a test taker scored when compared to all other test takers who took the exam (e.g. all test takers who took the NMAT by GMAC™ exam). For example, if a test taker is said to be at the 75th percentile, the test taker scored better than 75% of the test takers who took the NMAT by GMAC™ exam. How will a test taker receive the results? Test takers will not be sent any results directly. NMAT by GMAC™ will publish scaled scores section wise within 4 to 5 weeks after the test taker has tested. Candidates will be notified by email on availability of their score report which a candidate can access by logging into the NMAT by GMAC™ account. Please refer www.nmat.org.in for final result announcement date. How does a test taker register for NMAT by GMAC™? Test takers can register for NMAT by GMAC™ through an online registration application available on the website www.nmat.org.in from 9:00 am (IST) onwards starting July 4, 2017. Online registrations will close at 11:59 pm Indian Standard Time (IST) on Oct 3, 2017. GMGC shall not accept registrations from test takers in any other mode or form. Why should a test taker register early? Test taker will be able to schedule the test on his / her preferred date, time slot and Test Centre only if seats are available at that Test Centre for the date and time slot being sought (First Come First Serve basis). As test takers will be required to schedule their test after registering through an online application system, the earlier they register, the sooner they will be able to schedule their test. Test takers may not get their preferred date, slot and Test Centre if other test takers have already taken up the available seats for that particular date, slot and center. In such a situation, test takers would need to look at other options of date, time slot and Test Centre and schedule their test accordingly. Also an early test scheduling helps in planning for retake attempts within the 75 days exam window, should it be required, as a minimum gap of 15 days are required between two attempts. Does the "First come First serve" principle apply to Registration or Scheduling or both? "First come First serve" principle applies to both registration and scheduling. The earlier one registers and makes payment, the earlier will be able to schedule the test. And the earlier one schedules the test, higher are the chances of getting preferred date, time and test location. Can a test taker edit his/her registration application post registration payment? Test takers will be able to edit only certain section like School Preference and Communication Preferences in their registration form after submitting the registration fee. Test takers are advised to check the information entered in the online registration form very carefully while registering and once again before submitting the registration as they will not be allowed to make any changes after submission. What are the specifications of the photograph to be uploaded on the registration Application? Photos should be in one of these formats: JPG, PNG, GIF. Size should not exceed 1 MB. Photo should have either white or lightly colored background. Eyes should be open and clearly visible. Test taker face should be distinctly visible, straight and at the centre. Shoulder tops should be also clear on the photo. Facebook photos and/or photos not having the above mentioned specifications of size. Photos in which the test administration staff cannot sufficiently authenticate your identity. Photos with a dark color background. If a test taker could not register online for the NMAT by GMAC™, as the following error message appeared - "Java Script Error". What should he/she do? Please use Internet Explorer v.6.0 and above, Mozilla Firefox or Google Chrome. If a test taker could not register online for the NMAT by GMAC™, as he/she was not able to proceed after "I agree". What should the test taker do? In the application form, what should the test taker fill in the Category field? Foreign Nationals should also select GEN (General) in this field. Can a test taker register multiple times? Test takers are not allowed to make duplicate/ multiple registrations. Candidature of a test taker is liable to get rejected and fee forfeited, if the test taker registers multiple times. Test takers applying to various programs being offered by NMAT by GMAC™ accepting schools are also required to register only once and take up to a maximum of 3 attempts, including NO SHOWS. For retakes of the exam test taker has to pay applicable fees as per retake policy. Candidature of a test taker is liable to get rejected if the test taker has registered multiple times and has taken tests under different registration numbers. What if a test taker cannot register by the last date of registration? Does he/she have an option of registering late? Test takers who are unable to register in the Registration window between July 4, 2017 to Oct 3, 2017 will have the option of registering through the online registration application available on the website during the Late Registration window from Oct 4, 2017 to Oct 14, 2017 by paying the prescribed fee as specified on the website. What is the fee for NMAT by GMAC™exam? Test takers applying for NMAT by GMAC™ exam can register for the programmes of NMAT by GMAC™ accepting Schools. Following table provides the applicable fee for NMAT by GMAC™. Credit & Debit Cards (Master and VISA), American Express, Diners Card are accepted for registration. Apart from these cards candidates can pay through Net banking, UPI and Mobile Wallets as well. Card Verification Value (CVV) is 3 or 4 digit unique number at the back of the credit card. In some cards, the CVV number may also be written on the front of the card, above the card number. The test taker has registered online and successfully completed the payment. What is the next step? Test takers will receive an e-mail informing them about payment receipt and successful registration. Test taker can download / print payment receipt and Admit card from the NMAT by GMAC™ account. In case a test taker has not received the same, he/she should contact the NMAT by GMAC™ helpdesk (+917863008300). Candidates can schedule the test once the registration and payment is successful using the Registration system. How can a test taker schedule the test for the first time? Test takers are required to register online on www.nmat.org.in by filling in required details. Next step involves payment through the preferred mode of payment. Once the registration application is found to be complete in all respects and the payment has been received by GMGC, the test taker can schedule the exam by through Schedule/Reschedule exam tab in candidate dashboard available in the NMAT by GMAC account . Test taker will be able to select the date, time slot and Test Centre of his/her choice based on the availability of seats. The test will then be scheduled on a first come, first served basis (the earlier a test taker registers online, the better the chances of taking the test at the location, date and time of their preference). Following that, a confirmation e-mail will be sent to the test taker containing the location, date and time of the scheduled test. What is the difference between Registration and Scheduling? Registration means filling the online registration application and making the requisite payment on www.nmat.org.in Scheduling means test takers scheduling their test for a certain date, time and centre. What can lead to cancellation of the registration? Test takers need to ensure that the information submitted by them is correct and true in all respects. If any information is found to be incorrect or false at a later date, GMGC reserves the right to prevent the test taker from testing and/or cancel the test score. In the event of the prohibition to test or cancellation of the score due to furnishing of incorrect/false information, the test registration fee will not be refunded. NMAT by GMAC™ registration will also stand cancelled if there are duplicate registrations, the application has incomplete information or test fee is received by GMGC after the due date. Can a test taker re-schedule the test? A test taker can re-schedule the test 72 hours or more prior to the scheduled appointment, subject to availability of seats, upon payment of the applicable fee. The re-schedule window will remain open from July 04, 2017 to December 15, 2017. Please also note that this transaction on any Master Card or a Visa card may be processed in US Dollars equivalent of the applicable fee, and depending upon the credit card organization’s arrangement there may be certain service charges or commission charged to the credit card account to be borne by the test taker. Please note that payment can only be made through a credit card (Master Card and Visa) as seats cannot be reserved and a real-time payment method is required to secure the new test appointment. When and how can a test taker decide to take a retake? A test taker after taking his / her test can decide to retake NMAT by GMAC™ exam. 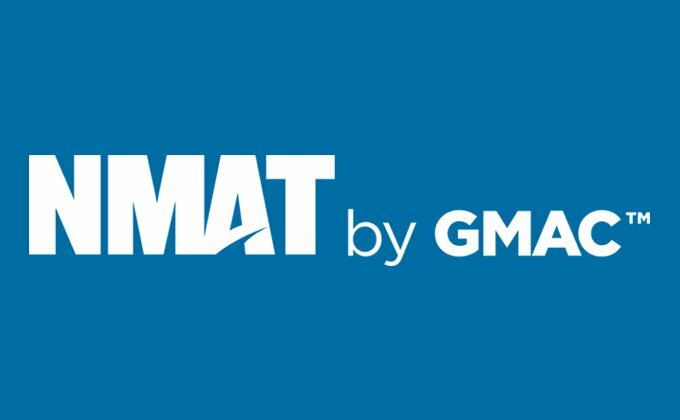 Test taker will be allowed to pay for the retake test in the Retake tab in candidate dashboard available in NMAT by GMAC™ account by paying the applicable fee through the available payment modes. Retake option will be enabled in the test takers’ existing registration account after taking the first test and separate registration account is not required. A test taker is allowed to take the NMAT by GMAC™ exam, a maximum of three times (first attempt plus a maximum of two retake attempts, including NO SHOWS). A Test taker will be allowed to schedule the retake test on a date which is 15 days or more, later than the date of his/her previous attempt. In other words, a test taker will have to wait at least 15 days before he / she can appear for a retake attempt. Test takers are required to pay the applicable fee for each Retake attempt. When and how can a test taker decide to take a reschedule? The Rescheduling option will be available to test takers for the period starting July 04, 2017 to December 15, 2017. A test taker can decide to reschedule his / her test no later than 72 hours prior to the scheduled test, to a different date, time and test centre, subject to availability, by paying an additional fee through Credit Card only. After the test taker receives the confirmation e-mail from Pearson VUE, she or he will be able to reschedule the test. Seat availability in terms of test centre, slot or date will be on a “First come First serve” basis. A test cannot be rescheduled if 72 hours or less remain before the scheduled appointment time. If a test taker appeared for the first time in the NMAT by GMAC™ today. Can he/she schedule the retake test today? Yes, the test taker can schedule the retake test today for a date which is minimum 15 days later than today. Can a test taker take the exam over two consecutive days? No, a test taker cannot take the test on two consecutive days. The test taker will be required to wait for 15 days before he/she can appear for the retake test. Can the test taker reschedule the test for later in the day? No, the test taker cannot schedule the test for the same day. Test takers can schedule the test for any time 24 hours or later. After taking the NMAT by GMAC™, can a test taker schedule the retake for the same day? No, the test taker cannot schedule his/her test for the same day. One can schedule his/her test for any time 24 hours or later from now. Also, there should be a gap of minimum 15 days between two attempts. What should the test taker carry on the day of test? Admit Card: Admit card is a document containing test taker registration details and photograph. Test takers are required to produce the admit card along with the necessary IDs and confirmation letter on the day of the test to allow them to take NMAT. Photocopy of the Primary ID for submission at the Test centre. Copy of Xth class certificate in case there is mismatch in the name between Xth class certificate and Test taker ID. A test taker is supposed to bring the confirmation e-mail printout along with him/her on the day of the test. What is the confirmation e-mail and how does a test taker get it? Confirmation e-mail is the communication that the test taker receives on the e-mail ID mentioned on the registration application after a test taker has scheduled the test. It contains details of the test – day, time and test centre name and address. What is the Admit card? Why is it important and how do one get it? Admit card is a document containing test taker registration details and photograph. Test takers can download their Admit card from the "Admit Card" tab provided in the NMAT by GMAC™ acoount. It is mandatory to carry the admit card along with required IDs, confirmation letter and photocopy of the primary ID to be allowed to enter the NMAT by GMAC™ test centre. When should a test taker report to the test centre? Test takers must report to their allocated test centre forty five (45) minutes prior to the scheduled time mentioned on their confirmation e-mail. What will happen if a test taker reaches late for the test? Test takers, who arrive at the test centre on the specified scheduled test date more than fifteen (15) minutes after the scheduled exam start time, may not be permitted to take the test and will have to forfeit the full cost of the test. What will happen if a test taker does not appear for the test? Test takers, who do not appear at the test centre on the specified scheduled test date(first attempt or retake attempt(s)), will have to forfeit the full fee of the test. They will be marked a “No Show” and this will be treated as an attempt. Test takers will be allowed a maximum of 3 attempts in NMAT by GMAC™ including “No show” as per the retake policy. What is the test taker identification process on the day of the test? All test takers will have to go through a test taker identification process on the day of the test. Digital photograph and digital signature of each test taker will be taken and kept for records. Any test taker not willing to participate in the test taker identification process will not be allowed to sit for the test. Please note that tests will be administered under video surveillance. Should the name of the test taker match with the name appearing on the identification documents? *Note: In case of test taker name change, the test taker must show relevant legal documentation as proof of name change. Test takers are required to enter their name in the registration application as exactly mentioned in the photo ID proof. At the test centre, the test taker’s name needs to match the photo and signature ID documents that the test taker is carrying for verification to the test centre. A test taker needs to make calculations or make notes during the test; does he/she need to carry a rough sheet with him/her? Test takers are not required to carry anything with them other than the confirmation e-mail print out, Admit card and two IDs for the test. Required stationery will be provided to the test taker by the invigilator at the test centre. Are there any breaks during the test? There are no scheduled breaks in the test. However, test takers can take unscheduled breaks if they want during the test session. An unscheduled break means a break during which the test clock does not stop. If a test taker chooses to take a break, the actual time spent on the break will be deducted from the time allocated to complete the test. No extra time will be given to complete the test. During the break, the test taker must leave the testing room. Upon re-entering the testing room, the test taker must show a valid ID. Will a test taker be allowed to access his/her personal belongings during the unscheduled breaks that he/she take? Test takers will not be allowed to access any personal belonging including study material and mobile phone during the breaks they take. Test takers will only be allowed to access food or medicines, if any. While taking the test, can a test taker return to previous questions to review them or change answers? Test takers can choose the order of sections in NMAT by GMAC™ exam. Every section has a time limit associated with it and during the time allowed for the section, test takers may move freely within the section. Test takers may return to previous questions, change their answers and mark questions that they would like to review before completing the section. However, once the test taker completes the section or the section time is over, the test taker can no longer access any question in that section. What happens if a test taker clicks “NO, I do not Accept” on Non-Disclosure Agreement (NDA) screen by mistake? Test takers are required to click on “Yes, I accept” on NDA screen to start their test. If the test taker clicks on “No, I do not accept” deliberately or by mistake, he/she will be prompted to change the option on the next screen. However, if the test taker still clicks on “No, I do not accept”, the test will end. Test taker will then not be able to resume the test that day under any circumstances. Test centre staff will not be able to do anything and the test taker will lose the test attempt as well as forfeit the test fee. If while reviewing the questions on Review Screen, a test taker happens to click “End Review”, will he/she be able to return to the exam or review screen? Once the test taker clicks on “End Review” button, the test taker will be prompted to confirm if he/she wishes to end the review. If the test taker reconfirms, then he/she will move to the “Next Section” or the “End Exam” screen as per the case. The test taker will not be able to return to the previous section or the review screen. What will happen if the computer malfunctions in the middle of the test? In the unlikely event of a computer malfunction during the test, the test centre staff will need to reboot the computer. During this process, the test taker will not lose any answers already entered. The computer system in the testing centre stores all test taker answers instantly. After rebooting, the computer will come back exactly to where the test had stopped. Please note that the time clock will have stopped when the computer reboots, and the clock will start as soon as the test is re-started by the test taker. If a test taker faces any problem because of computer malfunctioning, he/she should inform the Test Administrator immediately and the test will resume from the same point where the test taker had left at the time of malfunctioning. No request will be entertained after the section or the test is over. What should the test taker do if there is any problem with the test content or questions in the test? Test takers are advised to continue with their test after informing any doubts related to a problem with test content, questions or answer options to the Test administrator present at the test center. The Test Administrator will take the appropriate action to inform the same to Pearson VUE and GMGC. The complaints will be reviewed and if found correct, GMGC and/or Pearson VUE will take appropriate action to address the same and the test taker will not be penalized. No further communication will be entertained in this regard. Will a test taker see the results on the day he/she takes the test? Test takers will not receive their results on the day they take their test. The results will be displayed on NMAT website after 4-5 weeks of the test taker taking the test. What all activities are considered as prohibited before, during and after taking the NMAT by GMAC™ exam ? •	Receiving, discussing or disclosing exam content via text message, e-mail, in any internet “chat room” message board, or any other forum, before, during (including the break time), and after any administration of the NMAT by GMAC™ exam. What are the penalties or consequences ? What is Computer Based Testing (CBT)? CBT is a method of administering tests at a pre-determined testing location in which the responses are electronically recorded, assessed or both. What computer skills are needed to take tests via CBT? The user interface is designed to minimize reliance on computer skills. Test takers do not need to have prior computer experience to use CBT. At the beginning of the test, each test taker will receive a brief introductory tutorial that will instruct him/her on how to use the computer to answer questions and review responses. No typing skills are needed. The test taker will use the computer mouse to highlight and confirm the response selected as each question appears on the screen. An invigilator will always be available to answer questions regarding navigation throughout the duration of the test. A demo test is also offered free on the website for test takers to acclimatize themselves before the test. Does it take more time to complete the computerized test as compared to the paper version? Experience with computerized testing reveals that it usually takes less time to complete the test. There are no test booklets and answer sheets to manage and no need to transfer answers manually to an answer sheet with CBT. Is some support available for differently abled test takers? Pearson VUE, the CBT provider for the NMAT by GMAC™ exam is fully committed to comply with the Persons with Disability (Equal Opportunities, Protection of Rights and Full Participation) Act, 1995 for test takers with documented proof of impairments. Test takers who wish to request for special assistance must fill the details in the online application while registering. The test takers must scan their Disability Certificate and upload to the registration application in order to be approved for necessary accommodation. Each application will be reviewed on a case-to-case basis. Pearson VUE will contact the candidate to schedule his/her test at their preferred test centre, date and time with the approved accommodation and will ensure proper assistance is provided to them. What are the advantages of a CBT over paper-and-pencil (p & p) test? Time saving – Test takers generally have to report at a p & p test centre much ahead of the scheduled time for the test, start at the same time and take mandatory breaks and lunches to prevent test takers moving in and out of the testing room at different times. In a CBT environment, conditions are much more flexible. Test takers can report up to half an hour prior to the test time and choose to take breaks as per their convenience. Flexibility in scheduling – A p & p test is offered at a limited number of test locations on limited test dates, therefore test takers may have to incur high travel costs and forgo opportunities as a result of the limited access to the test event. The greater frequency of administration dates and venues provides test takers with increased access and scheduling flexibility, thus resulting in savings for them. Test security – Test security is enhanced due to controls built into the delivery systems that limit questions to be seen by the test taker (test taker can only see one question at a time) and limit test access to authorized individuals only. Differently abled test takers – Most CBT interfaces are easy to use and they offer a standard testing environment that can be effectively adapted for test takers with special needs. User interface – User Interface is designed to minimize reliance on computer skills. Test takers are not required to have prior computer experience to use CBT. At the beginning of the test, each test taker receives a brief introductory tutorial that instructs him or her on how to use the computer to answer the questions and review responses. No typing skills are required. As each question appears on the screen, the test taker uses the computer mouse to highlight and confirm the response selected. An invigilator is always available to answer questions regarding navigating throughout the duration of the test. Format – The CBT is set up in a linear format. In a linear format, the test taker can answer a predetermined number of questions. The test questions do not become increasingly more difficult based on answers to previous questions. Test takers are able to move forward and backward throughout the test, bookmark questions for return and review and change answer selections as many times as necessary during the allotted time before clicking the finish and exit button of the test. On-site assistance – Adequate on-site support is provided in the event that test takers need assistance during the testing session. How can a test taker contact the NMAT by GMAC™ helpdesk for registration and payment related queries? Please refer to the information given at the page www.nmat.org.in. How can a test taker contact the NMAT helpdesk for test scheduling and rescheduling queries? Why take the NMAT by GMAC™ ? It is accepted as an admissions criterion by the leading management institutions in India. Today the NMAT by GMAC™ is accepted by the following leading institutions and this list is growing. Pursuing a management degree at one of these universities makes the pursuit of your dreams that much easier. It measures the skills needed to succeed in business school. When entering business school – you want to know that you have what it takes to succeed and graduate with flying colours. Having been selected using an assessment that measures the skills to succeed in business school gives you the confidence that you can handle the curriculum and have a fulfilling b-school experience. Taking the test multiple times: You can take the NMAT by GMAC™ three times in a given admissions cycle. This gives you the confidence that you have more than a single opportunity to perform your very best. Choosing the section order: The NMAT by GMAC™ allows you to choose the order in which you respond to each of the sections on the test. This allows you to play to your strengths. No negative marking – Sometimes you’re just not sure of the right answer on the test and are running out of time. Well you can make an informed guess instead of skipping a question without the fear of a penalty for a wrong answer. The system of no negative marking is in line with global practices. Choosing a date, time and location of your convenience: A long testing window allows you to choose a convenient test date. The 75-day test window opens the first week of October and extends through the third week of December. Self-scheduling: You can choose your test appointment date, time and location in real-time based on the availability of seats at each test centre. Register for the NMAT by GMAC™ exam from your mobile – allowing you to register anytime and anywhere. Sending scores to up to 5 programmes for free. You can choose to select the list of schools/programmes you want to send your scores to before or after taking the exam. Up to 5 schools/programmes are included in your registration fee. However, you will be able to send your scores to more than 5 schools/programmes before or after you register for an additional fee. Applying to business schools after reviewing results. You can view your results and then decide to apply to business school or retake the test depending on your comfort with the results you’ve obtained.